From political satire to performance and archive, responses to this year’s theme ‘Absorbing Modernity 1914-2014’ at the Venice Biennale www.labiennale.org/en/architecture are varied and interesting. 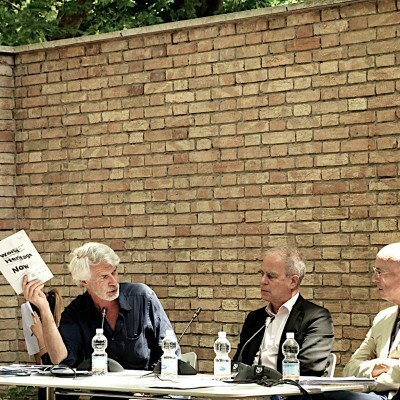 At the Swiss pavilion a marathon program of talks during the opening days was orchestrated by London based curator Hans-Ulrich Obrist around the legacies of sociologist Lucius Burckhardt and architect Cedric Price’s 1960’s concept the Fun Palace. The radical visions of high modernism, perhaps Le Corbusier, a fellow Swiss who dreamt of re-organisning the centre of Paris, were considered by Jacques Herzog as modernist provocations. Herzog spoke about Burkhardt’s influence: “Lucius was sharpening our awareness to ask other possibilities and not always do the big gesture. You have to keep stuff.” He said that one of the big challenges in architecture is “dealing with pre-existing forms”. Elsewhere the question of preservation was raised at the Arsenale in the Albanian exhibition overseen by Beyond Entropy. Simple urban structures are significant as part of the country’s heritage that should be preserved from radical master planning. Atelier Albania is a Dutch-funded organisation that looks for the creative potential in Albania’s future by restoring organic systems instead of radical redevelopment. It’s an interesting situation, where real possibilities could be explored by saving informal aspects in cities.